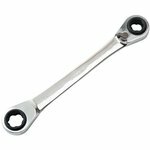 Ratcheting wrench is a multipurpose tool used for screwing or unscrewing bolts, couplings or nuts in various connections. 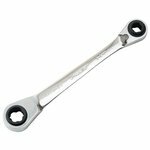 Adjustable ratcheting wrench which supports 12 different sized nuts: 8, 10, 11, 13 mm / 5/16”, 3/8”, 7/16”, 1/12” / E10, E12, E14, E16. Adjustable ratcheting wrench which supports 12 different sized nuts: 14, 16, 17, 19 mm / 9/16”, 5/8”, 11/16”, 3/4” / E18, E20, E22, E24.